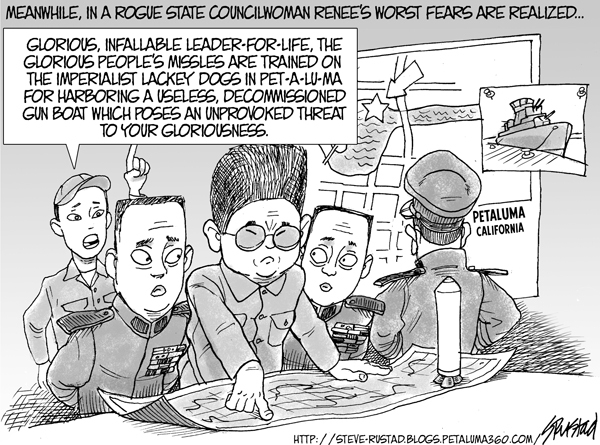 Councilwoman Renée referred to her comments about the international threat to Petaluma posed by a decommissioned WW2 gunboat as “pithy,” and averred that they were made in reaction to a request she deemed irresponsible in light of the City’s financial distress. Well, okay. Since the definition of “pithy” is: brief, forceful, and meaningful in expression; full of vigor, substance, or meaning, I guess we can surmise from her comment that Ms Renée is substantially, vigorously and meaningfully ignorant of both international relations and economic opportunities. At present, North Korea is a direct military threat to only South Korea. And since the gunboat is currently financially self-sustaining at it’s Mare Island berth, one can only assume that it would pose little drain on River City’s treasury and might even bring in some needed tourist dollars.